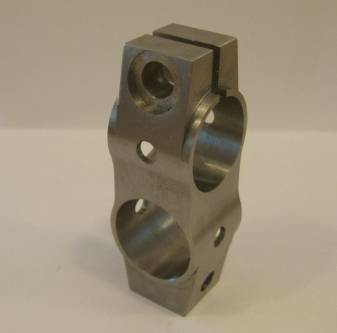 OneCNC today announced the pre-release to limited users of OneCNCXR3 Lathe Mill Turn product. The product has been in BETA for several months and it is still expected to be on track for release end of January 2009. Well you can see this completed part. This was created and programmed by Neil from OneCNC Benelux as a test in the BETA stage of development. Euromold 2008 was held in Frankfurt Deutchland December from the 3rd to December 6th 2008. The 15th EuroMold closed its gates on Dec. 6, 2008, and had for four days hosted 58,842 from 87 countries. That means, the proportion of international attendees has grown in comparison to last year’s EuroMold. 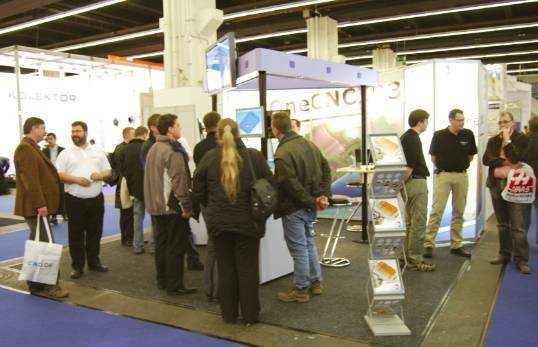 In total EuroMold 2008 greeted 19,535 international visitors, a quota of 33.2 % of all attendees. OneCNC Deutchland participated in this show with OneCNC members from OneCNC Deutchland, OneCNC Poland, OneCNC Denmark, OneCNC Sweden, and OneCNC Australia. The OneCNC exhibition included demonstration the complete range of OneCNC products as well as the global launch of the OneCNCXR3 Lathe Multi-Function ability of C+Y+B axis machining. 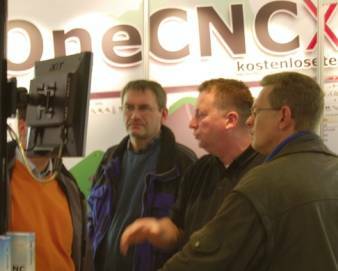 Here we see Jan from OneCNC Sweden (left) and Allan (right) from OneCNC Denmark having a look at OneCNCXR3 with the new simulation and rest software Bob had brought from Australia for release at the show. Each day was very busy demonstrating OneCNCXR3 to new and existing customers. This is now the fourth year in a row that OneCNC attended Euromold. The new products were of great interest to prospective as well as existing customers and very well received. Many users commented that OneCNC is very progressive with development and each update greatly assists performance enhancement in the shop. 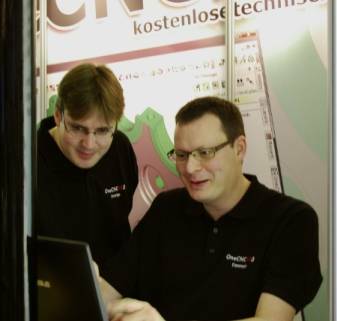 Here we see Sebastian (right) demonstrating the new features of OneCNCXR3 to a user of the OneCNCXXR3 Expert with 4 axis and the customer views his part for the first time fully simulated with metal removal simulation. This was indeed a very good program of a foot pedal for a leading brand German motor bike. 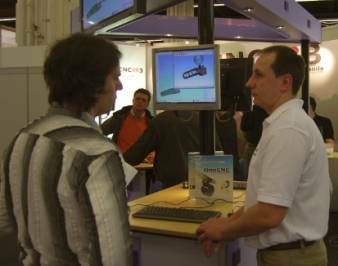 Here we see Uwe (second from right) how busy he was demonstrating OneCNCXR3 to customers each day of the show. It was interesting to note that OneCNC could demonstrate in German, Danish, Swedish, Polish and English languages as a first language at the show. 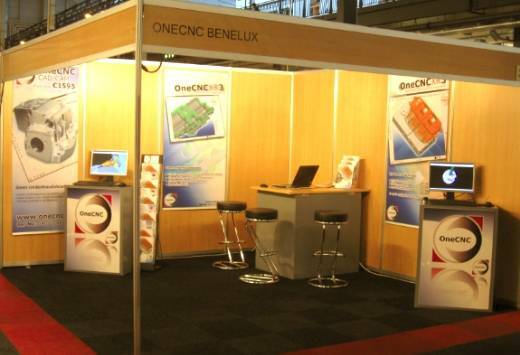 OneCNC Benelux exhibited at the Metavak & Gebruikte Machinevak 18-20 th November 2008 in Gorinchem Netherlands.